Shopify is an ecommerce solution that allows you to set up an online retail store to sell your goods. In this article, we'll show how to track Sales and Order related metrics from your Shopify store on your Geckoboard dashboard. Which metrics and visualizations are available for Shopify? Display the number of orders or revenue from sales for a given time period. This can be filtered by payment and fulfillment statuses. Optionally, a secondary stat. can be displayed as well. Display the RAG (Red, Amber, Green) status of orders or sales for a given time period. These are split out by abandoned, pending, paid payment statuses. 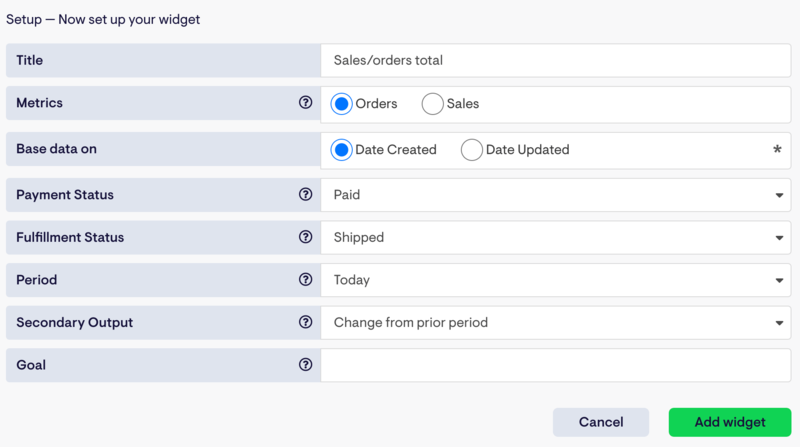 Display a RAG status of orders or sales for a given time period. These are split out by unshipped, partially shipped and shipped fulfillment statuses. Search for Shopify using the Search sources field. Alternatively, you can also scroll down the alphabetical list of integrations until you reach the Shopify integration. Click on the Shopify integration. Is this is your first Shopify widget? You'll need to connect your Shopify account to Geckoboard. If not, you can skip to our example Shopify widget. 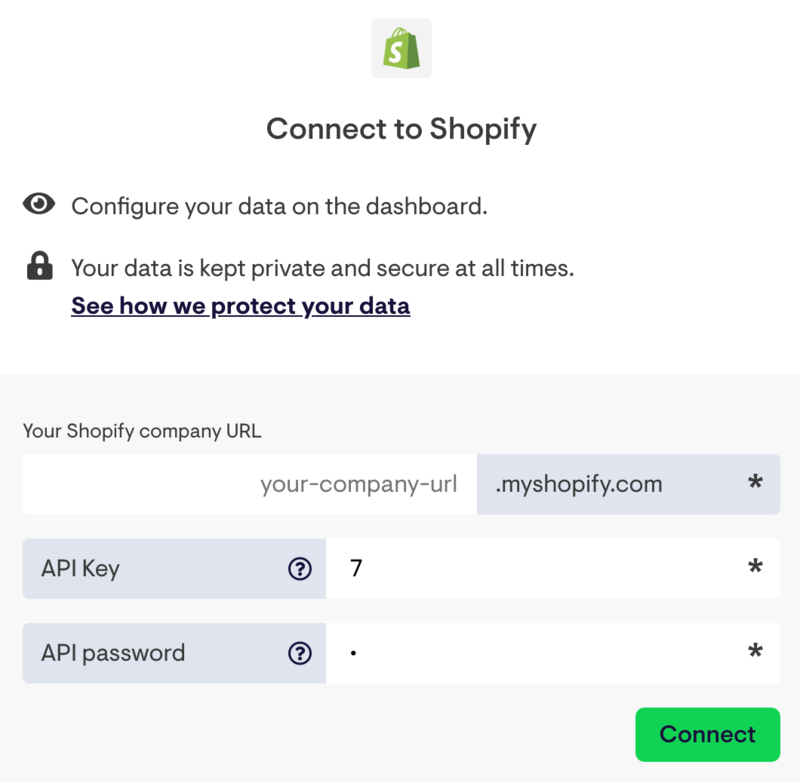 When adding your first Shopify widget, you'll be asked to create a connection and authenticate your Shopify account so that we're able to collect your data and display it on the dashboard. You only need to create this connection once – we'll take care of the rest. The authentication box will ask you to enter your Shopify company URL. This would be the name of your Shopify account. For gecko.myshopify.com, it'll be gecko. You'll then need to enter your API key and password. These are required by Geckoboard to access your Shopify store and display metrics. 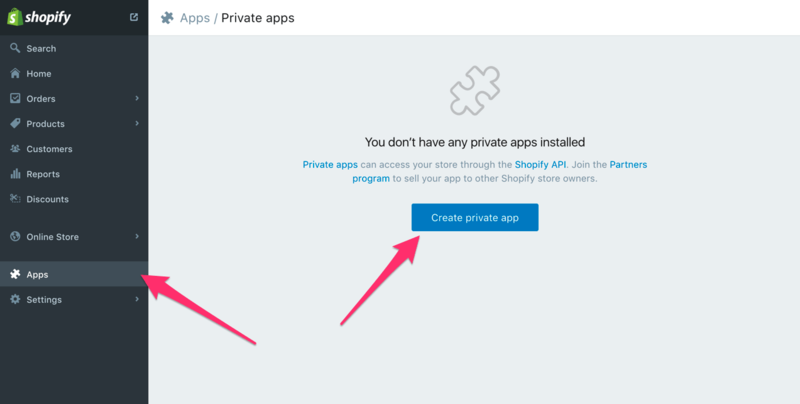 You'll first have to create a new Private App from within your Shopify account. Give your Private App a suitable name so that you can keep track later on. Pick up the API key and password. You're now ready to configure your first Shopify widget! Any Shopify widgets you create will pull in and display data from this Shopify account. If you manage more than one Shopify account, you can also connect multiple Shopify accounts to your Geckoboard. 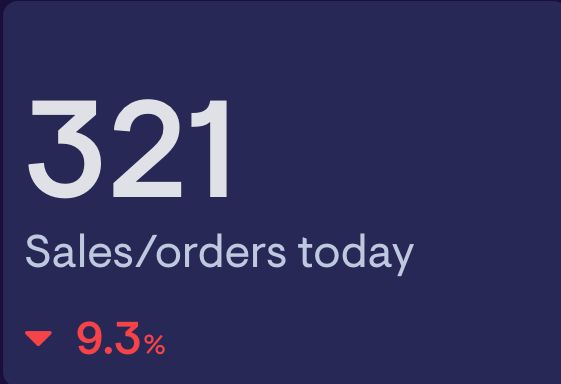 Use the Sales/orders total widget to display the number of orders that have been paid for and shipped today. As a secondary stat, we can also see how we compare with yesterday's performance.